The S4W Four way pallet jack is perfect for getting into those pallets into those awkward areas a forklift can't get into with the option of going backwards and forwards and also side to side. 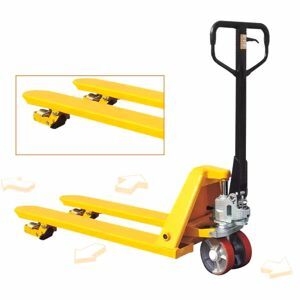 The NS-PJ-4W Four way pallet jack is perfect for getting into those pallets into those awkward areas a forklift can't get into with the option of going backwards and forwards and also side to side. No routine maintenance required on the hydraulic unit and bearings. Seals made in Germany, which prolong the working time of the hydraulic unit. Pressure relief valve/ overload valve so the unit can't be over loaded for OH&S purposes.